Once Upon a Twilight! : Emerald City Comic Con Day 1! Emerald City Comic Con Day 1! Today was my first time ever at a comic con. Yes I went when I met Matt Smith - but I seriously just went to meet Matt Smith and left. I did drive 2 hours away from where I live to meet him...and I didn't even stay and see what all there was. So I thought I was ready for what was to come, at least I had kind of been to a con...or so I thought. It was more than I was expecting and it made my fangirl heart so happy. We went with a set schedule in mind but I soon realized that while you have the panels in mind that you want to attend you have to plan for changes. Today Bobby Wagner and Richard Sherman (players from the Seahawks football team) were there. I thought they were going to be on the ECCC live stage at 2 but at about 1:45 my ECCC mobile app alerted me to the fact that they would be on the stage at 4:30. I was a little disappointed but it turned out to work for the better. Yes I wanted to see my Seahawks. I am a major football fan, and I absolutely love the Seahawks. Being from Seattle it's almost a sin not to like the Seahawks. So I was sad that I missed the opportunity to see them. But this gave me a chance to walk the floor. My best friend came with me and she has some friends and family who benefited from us walking around. She's nice and buys them presents. I also found some amazing things - I'm more selfish and bought things for myself. 2 book marks and a print from Camilla d'Errico! Who we had the chance to interview. I'll be making a separate post for the interview so make sure to watch for that! And today we also saw some amazing cosplayers in some amazing outfits! My favorite were Deadpool, Chewy and a Dalek. The Dalek actually rolled around. It was basically AMAZING! 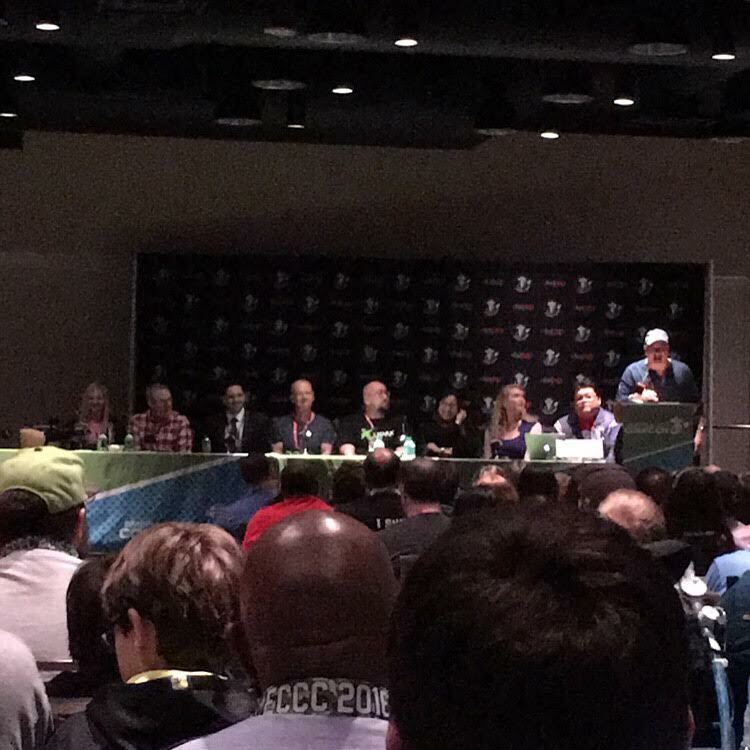 We were also able to attend the DC Panel today - where they talked about how the DC Universe Rebirth. Which is essentially a rebirth of DC's core characters! It sounds awesome! We also found out that the lead singer of My Chemical Romance, Gerard Way, has his own imprint with DC and has a few comics coming out soon! All in all the first day of #ECCC was a success. I really cannot wait to see what the rest of Emerald City Comic Con has in store!